Ottawa, Ontario, January 9, 2008 – One week after turning 100 years old, the Royal Canadian Mint (RCM) today released the first new collector coins and gift products of 2008. 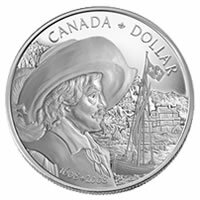 In keeping with its mandate of celebrating Canada’s values, history and culture, the RCM has chosen to devote the silver dollar, in proof, brilliant uncirculated and selectively gold plated finishes, to Samuel de Champlain, as a tribute to the 400th anniversary of the founding of Quebec City. This figurehead of the RCM’s annual collector coin program is followed by the perennial $100, $200 and $300 face value gold issues featuring themes which resonate from Canada’s East to West coasts, as well as the traditionally anticipated proof, uncirculated and specimen coin sets. The popular annual coin sets featuring a unique painted 25-cent coin are once more available in five different themes, as are annual baby and wedding gift sets. “Over 100 years, the Royal Canadian Mint has established a global reputation as a leader in the minting industry”, said Ian E. Bennett, President and CEO of the Royal Canadian Mint. “The quality and creativity which are hallmarks of the Royal Canadian Mint shine through in the first new collector coins of 2008. The themes they portray will resonate with Canadian and international collectors alike”. Below are several of the featured products that are being introduced this month. A pivotal figure in Canadian history, Samuel de Champlain landed on the shore of the St. Lawrence River in 1608 at a place the local Algonquin people called “Kebec” or “where the river narrows”. 400 years later, the banks of the St Lawrence are bursting with pride as millions of Canadians celebrate a milestone anniversary in the history of Quebec City, one of North America’s oldest and most enchanting cities. The Royal Canadian Mint is proud to join Quebec City, its citizens and its admirers across Canada and the world, in marking the city’s 400th anniversary on the 2008 proof silver dollar. 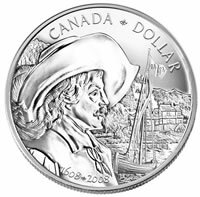 This sterling silver dollar features a portrait of Samuel de Champlain with the “habitation” he built at the foot of Cap-aux-Diamants, now Quebec City, in the background. This design is the work of Longueuil, QC artist Suzanne Duranceau. Limited to a mintage of 65,000, the 2008 Proof Silver Dollar retails for a suggested $42.95 CDN. The brilliant uncirculated version of this coin is also proposed at $34.95 CDN and limited to a mintage of 35,000. The same design is reproduced on a selectively gold-plated proof dollar coin, which is exclusive to the RCM’s 2008 Proof Set. Only 60,000 sets, with a suggested retail price of $89.95 CDN, are available world-wide. Another historical milestone yields the RCM’s 2008 $100 gold coin. 200 years ago, famed Canadian explorer Simon Fraser, a member of the North West Company, defied conventional wisdom and successfully reached the Pacific Ocean by descending the river which would become his namesake. This legendary feat took Fraser and his 23 companions 36 days of steely determination and later paved the way for the region’s development. 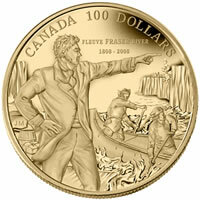 A dauntless Simon Fraser is profiled on this 14-karat gold coin with a $100 face value. His striking figure is the work of Toronto artist John Mantha. This coin is limited to a worldwide mintage of 5,000 and is proposed at $386.95 CDN. The agriculture trade is the subject of the fourth offering in the Historical Commerce 22-karat gold coin series. The attachment of humans to the land transcends history and the emergence of organized agrarian societies is the root of civilization itself. To Canadians, agriculture has sparked the development of our expansive territory into one of the greatest nations on earth. This proof-quality 22-karat gold coin features an iconic image of this historic trade: a team of draft horses steadfastly plowing a field. 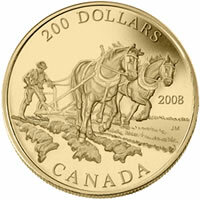 Limited to a mintage of 4,000, it is composed of 91.67% gold and 8.33% silver and retails for a suggested $619.95 CDN. 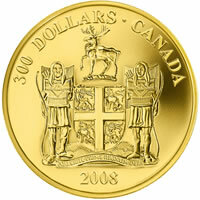 The RCM introduces a new $300 gold coins series devoted to the Official Provincial Coats of Arms. This imposing, oversize coin celebrates the rich heritage of Newfoundland and Labrador with a faithful reproduction of a Coat of Arms, created in 1638, on the reverse of this proof finish 14-karat gold coin. Only 1,000 of these coins have been minted, each proposed at $1,541.95 CDN. 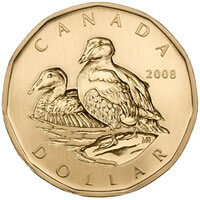 The Common Eider duck graces the limited-edition aureate dollar coin featured in the 2008 Specimen Set. This is the only RCM coin set to include this limited-edition one-dollar coin gracefully designed by British Columbia artist Mark Hobson. 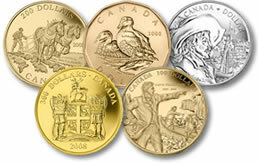 Also included are all of Canada’s traditional circulation coins (except the Common Loon dollar) in a unique specimen finish. The limited worldwide mintage for this set is 40,000, and it is available at the suggested retail price of $45.95 CDN. The RCM is once again issuing five 25-cent painted commemorative coins, exclusively available as individual centerpieces of popular annual uncirculated coin sets. Each unique 25-cent coin appears through a die-cut in the cover of the collection folder, presented in five different themes: baby; birthday; congratulations; wedding; and Oh Canada. Each set retails for a suggested $19.95 CDN. The Royal Canadian Mint also introduces a 2008 uncirculated set limited to a worldwide mintage of 75,000 sets. In keeping with the popular tradition of commemorating weddings or the birth of new family members, the RCM is introducing new 2008 gift products, including: baby keepsake tins with a sterling silver dollar; a baby lullabies CD and sterling silver dollar set; a special edition 2008 sterling silver coin set; and a 2008 wedding premium coin set containing a full set of circulation coins fashioned in sterling silver. True to its tradition of minting collector coins which speak to Canada’s rich heritage and culture, the RCM will issue a special colourized 25-cent collector coin to commemorate the 100th anniversary of Anne of Green Gables, the famous tale by author Lucy Maud Montgomery. Details of the celebrations being planned and “all things Anne”, including the RCM’s coin, becoming available in mid-April 2008, can be found at www.anne2008.com. All of the Mint’s products are available directly from the Mint at 1-800-267-1871 in Canada, 1-800-268-6468 in the US, or on the Internet at www.mint.ca. The coins are also available at the Royal Canadian Mint’s global network of dealers and distributors. The Royal Canadian Mint, which is celebrating its 100th anniversary in 2008, is the Crown Corporation responsible for the minting and distribution of Canada’s circulation coins. An ISO 9001-2000 certified company, the Mint is recognized as one of the largest and most versatile mints in the world, offering a wide range of specialized, high quality coinage products and related services on an international scale. For more information on the Mint’s history, its products and services, please visit www.mint.ca.